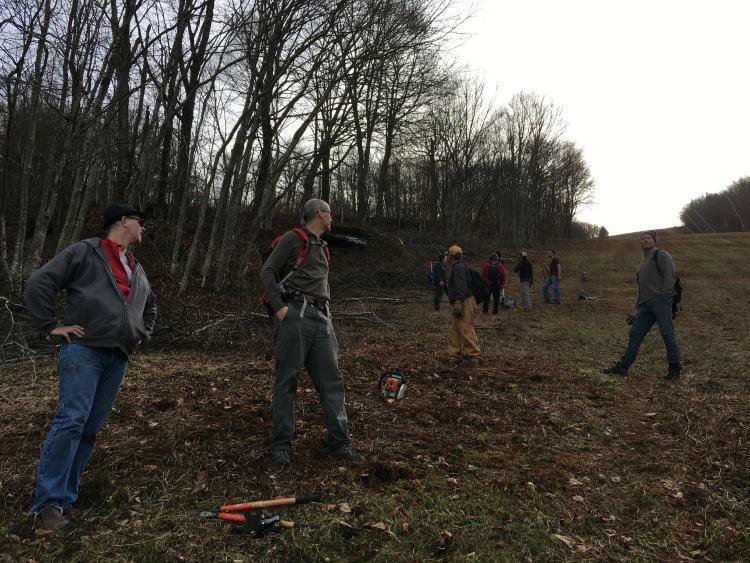 The trees were calling the faithful, as Plattekill Mountain hosted its 8th annual Glade Clearing Day on Sunday, November 4th. Despite it being a rain date, it was a record turnout. 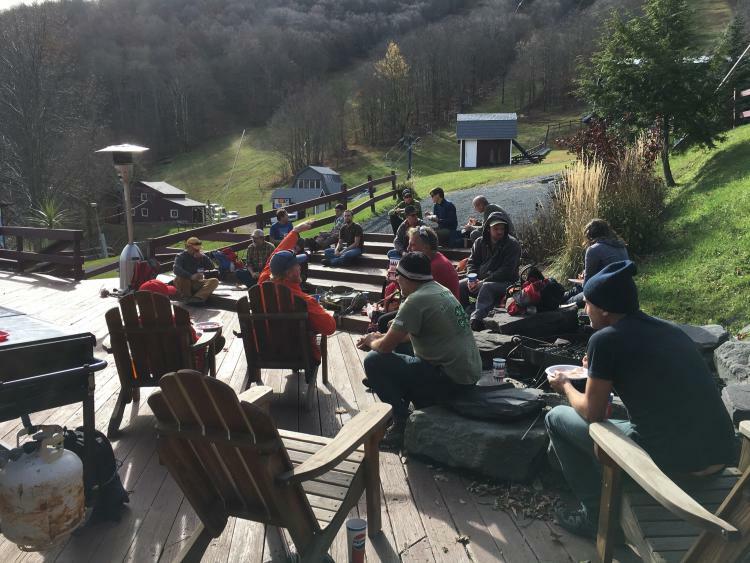 28 volunteers made it out to the mountain on a glorious fall day, along with 8 of Plattekill’s mountain ops crew, for a total of 3 dozen eager tree skiers ready to work. 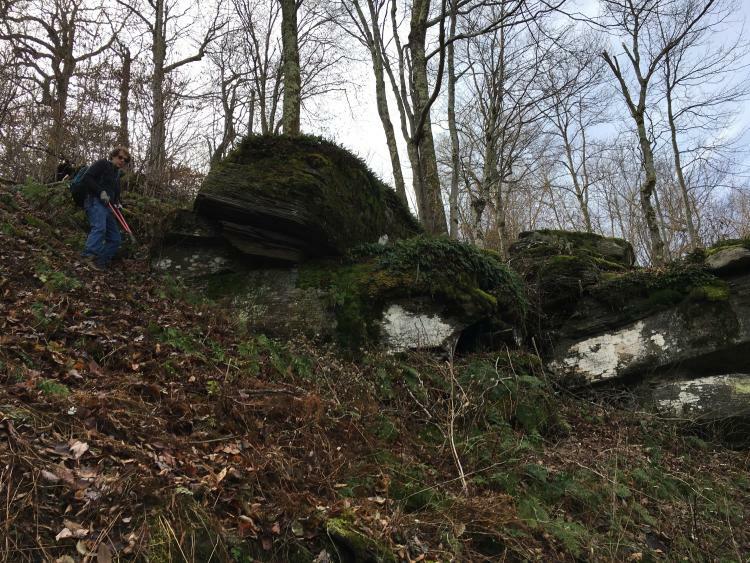 Plattekill GM Laszlo Vajtay dedicated the day’s work to Sean Riley, Platty’s unofficial out-of-bounds guide, who is recovering from a serious bout of ulcerative colitis and is determined to make it back to the mountain this winter. For many of us, myself included, Sean introduced us to the Platty side country and has guided us on many powder adventures through the woods, with the caveat of returning you safely to the lodge before dark. Laszlo’s suggestion that we cut a new line in Sean’s name, to be dubbed “Riley’s Revenge”, was met with a chorus of approval. After the signing of waivers and a brief discussion of our plan of attack, we began our ascent to the top of the mountain. This year we did things a little differently— Plattekill is undergoing a transformer upgrade this week, so there was no power to spin the lifts. Instead, everyone piled into 3 trucks and we 4-wheeled it up the mountain. 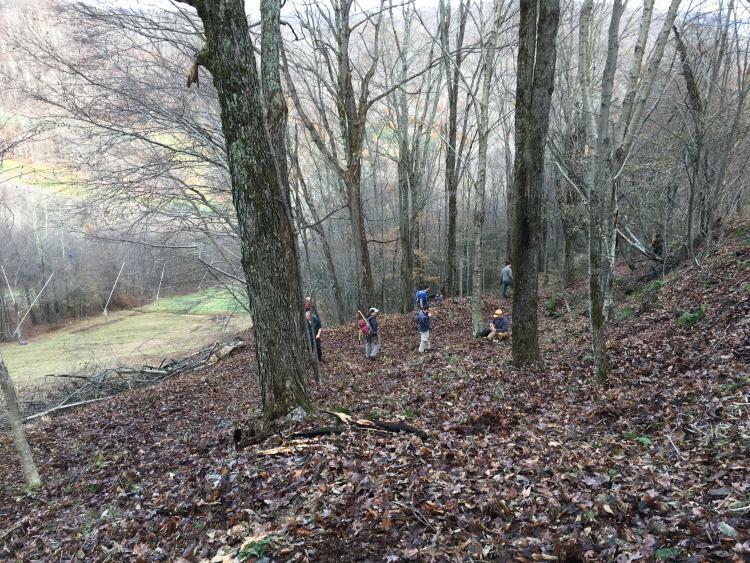 Once we reached the top, we split into two groups, and headed into the woods. The air was crisp but things warmed up quickly as saws and loppers began cutting. One group worked off a line established last year, dubbed the Apex. 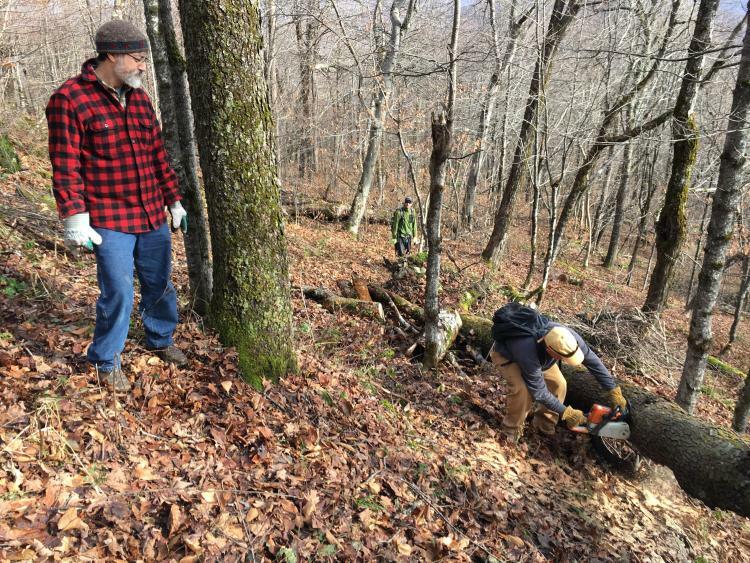 Last March saw a lot of traffic heading into the woods there, so we worked on widening the entry further down, removing lots of saplings and brush and creating more points to drop into the glade. The whole line in the glade got wider as we worked our way down skier’s left to Lucian’s Line, an advantage to having so many hands at work. Before long, stomachs began growling and it was time for lunch. We made our way out of the woods and onto Ridge Run, one of my favorite trails on the mountain. Ridge winds its way down the mountain, hugging the contours and creating plenty of natural features to have fun with on the way down. 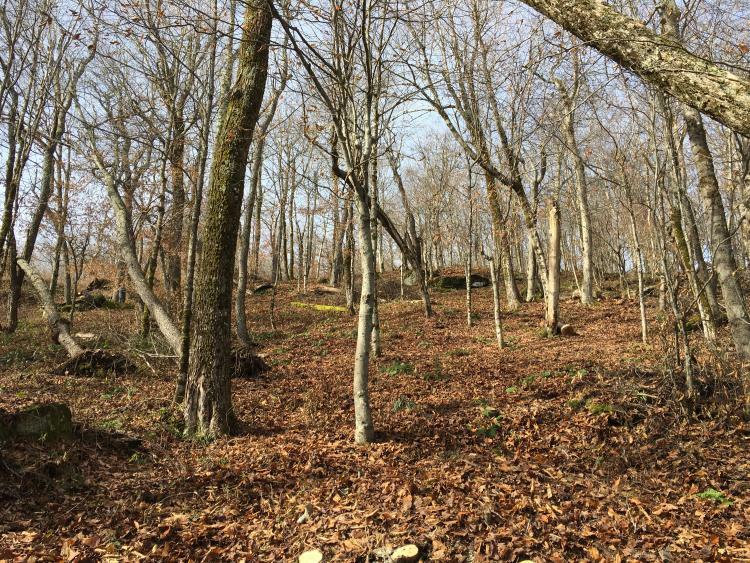 We walked down Ridge and we saw what the second group had accomplished: a drop-in to a very steep glade over a massive rock outcropping had been cleared. One can choose to huck the rocks or drop into a couloir to the right of it. Either way will exit the skier onto a steep runout onto Lower Twist. On a big pow day this will be a real adrenalin rush. Back at the lodge, we feasted on a delicious lunch of baked ziti and garlic bread, prepared and served by Marilyn, Platty’s chef extraordinaire. Then it was back into the trucks for round two. 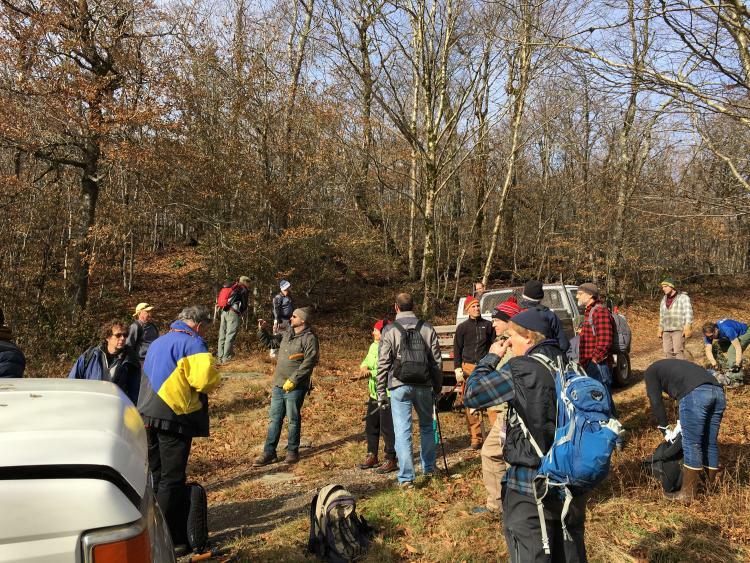 Again, we split into two groups, with Laszlo’s son Matt taking a group to an undisclosed location off the summit in the Land of Oz (where Riley is the Wizard), and the rest of us heading over to clear a section of woods near North Face. We opened up a few entry points into the glade, and cleared a wide path to a nice sized cliff off North Face. We also connected to a bike path above this cliff and continued clearing down the line through the woods, opening up a few more exit points, just above where Ridge Run dumps out onto North Face. 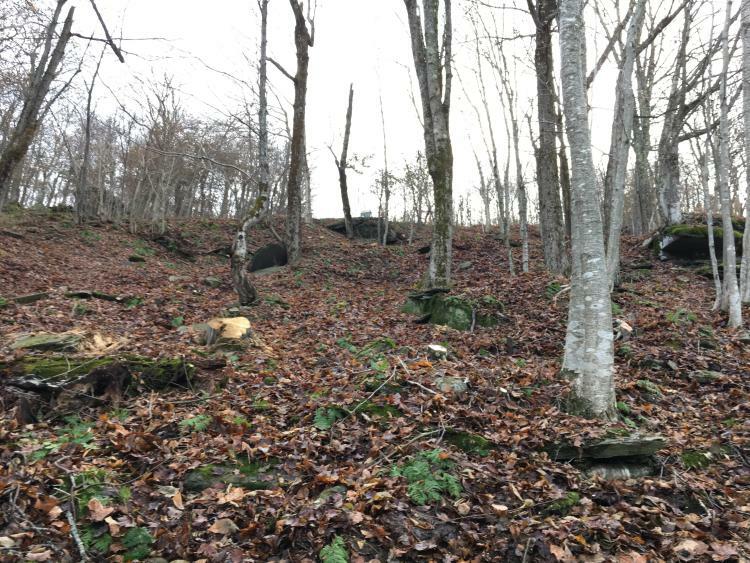 Someone joked how this sweet little glade could be Riley’s Revenge, because you could actually see the lodge when you came out! It was at this point we called it a day. With daylight savings time in effect, the sun was already behind the mountain, the temps were dropping, and it was time to head back to the lodge. We met Laszlo on the deck, who greeted us with beer and free lift ticket vouchers for the upcoming season. It was a great way to end the day, skiers taking care of a skiers’ mountain, and we are all grateful for it. Now let it snow. They letting you run a chain saw on their property without the proper safety equipment (Chaps, ear protection, etc)? They are taking a hell of a risk (and so is the chain saw operator) even though you signed a waiver. 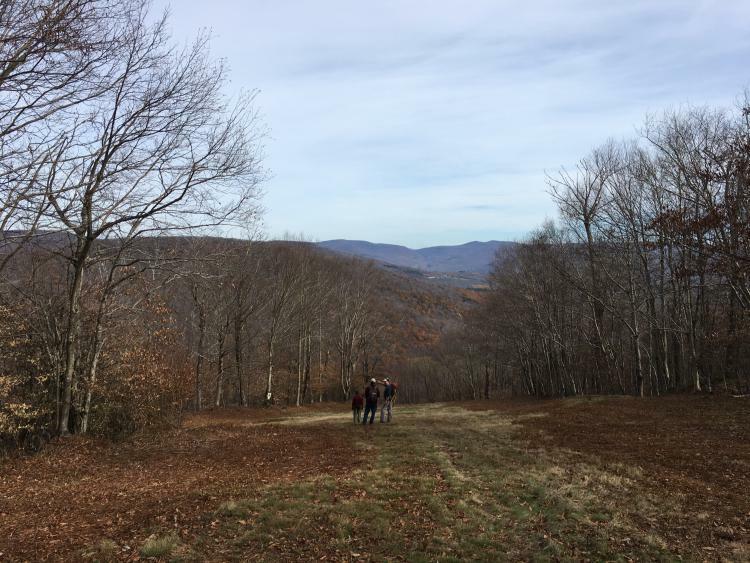 Click on Catskills Freeheel to visit my blog! That’s a community ski hill right there! Good to still see you around Plattekill! Agreed. I'm told Mr Freeheel will ski with us this season. I'm told Mr Freeheel will ski with us this season.